Let’s talk briefly about a particularly Fab Suffergette (and she’s not just fab because I dig her name, though I do): Amelia Bloomer. Ms. Bloomer was a local newspaper writer with a particular interest in the temperance movement and in 1848 she attended the Women’s Rights Convention in Seneca Falls, NY. It was there that Amelia met Elizabeth Cady Stanton, who Amelia later introduced to the young Susan B. Anthony. Something must have inspired her there because a year later she started the newspaper The Lily, which is may have been the first news publication written entirely by women. It was there Amelia and other suffergettes like Stanton wrote about such things as women’s rights, temperance, marriage law reform, and clothing reform. At the time, women were expected to wear tight corsets, big skirts, and layers upon layers of petticoats. Amelia wasn’t having any of that. She wrote: “The costume of women should be suited to her wants and necessities. 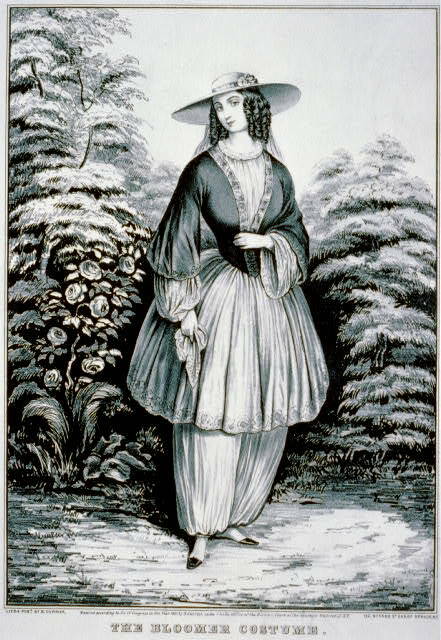 It should conduce at once to her health, comfort, and usefulness; and, while it should not fail also to conduce to her personal adornment, it should make that end of secondary importance.” So when she saw Elizabeth Smith Miller’s design for a new shorter skirt that was to be worn over pantaloons she immediately got on board and proclaimed it’s brilliance in The Lily. Elizabeth Cady Stanton and Susan B. Anthony are two of the major faces of American first-wave feminism. Both women began careers in activism as Abolitionists in the late 19th century. When Stanton was denied standing at the the World’s Anti-Slavery Convention in 1840 a fire was ignited. In 1848 at the Seneca Falls Women’s Rights Convention, Liz (because we’re so close, I can call her that) wrote the Declaration of Sentiments which explained that by denying women the vote, they are denying them a basic human right. Susan was so inspired by an article recounting a Women’s Suffrage Convention that she decided to devote her entire life to in and in 1851 she met Elizabeth at Seneca Falls. The two quickly formed at working relationship based on Liz talent for writing and Suz’s managerial skills and created The Revolution- a weekly Suffrage journal. Once The Revolution was under way Stanton and Anthony began to use more radical tactics to help their cause. On November 18, 1878 for voting in the 1878 Presidential election (“positively voted the Rebuplican ticket—straight…” she wrote Elizabeth. That meant something different then.). They used Susan’s trail to promote their cause and she gave speeches in the county in New York where the trail was taking place. Which is pretty effin’ impressive and ballsy (if you excuse the irony of the phrase). Even more ballsy (sorry!) when Susan was only sentenced with a $100 fine she declared that she would never pay it. And she never did. After there trial Susan and Stanton formed the National Womaan Suffrage Association (later it merged with the American Woman Suffrage Association to become the National American Woman Suffrage Association). The NWSA reflected Anthony and Stanton’s radical beliefs and allowed anyone to join so long as they whole-heartily believed in Women’s Rights. Elizabeth Cady Stanton stood as President of the NWSA and the NAWSA until Susan B. Anthony took over in 1892. Both women devoted their lives to end suffrage, yet neither lived to see women get the vote. Stanton died of heart failure in 1902 and Anthony in 1906; the Nineteenth Amendment was not passed until 1920. Still the legacy of these two indomitable women lives on. REMINDER: This is all for SLUTWALK NYC!